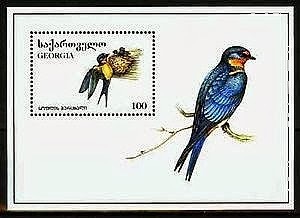 I'm initiating coverage of stamps of the Republic of Georgia with its 1996 set of two miniature sheets of 16 picturing birds (Scott #140-141) and the accompanying set of two souvenir sheets (Scott #142-43) The miniature sheets are quite attractive, while the souvenir sheets aren't. 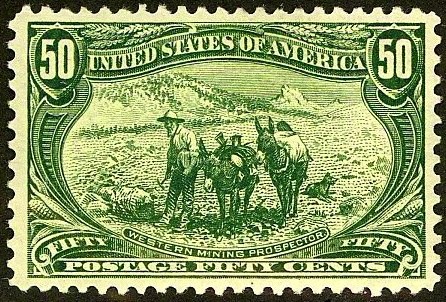 In any case, 37,000 of the miniature sheet sets and 23,000 of the souvenir sheet sets were issued, and Scott '14 prices them unused at $22.- and $12.50, respectively. 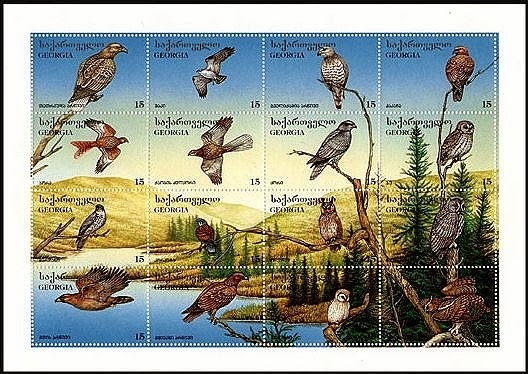 This issue appeals to Animal/Bird topicalists as well as being an inexpensive bet on the growth of Georgia's economy. Recommending it is consistent with my belief that one of the best ways to play the new and recently resurrected countries of Europe and Asia is to focus on popular topicals with low printings.